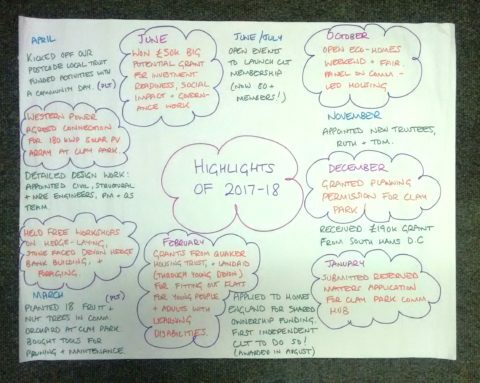 Thank you all who came to the November AGM where we celebrated the achievements of 2017-2018 as captured below. 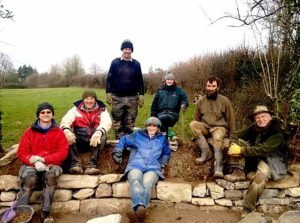 A huge thank you to those of you who helped to plant our orchard, build a new Devon stone wall and rebuild another area of stone wall. Red Earth have installed a 'Boardwalk' over the muddiest part of the site! (almost finished) which is most welcome visiting the site after these heavy rains! We are in the process of appointing the building contractor and hope to announce this in the New Year. We have appointed Susie Peat as the charity's administrator for one day a week - who is busy helping Nicola apply for more grants and plan next year. Please add your suggestions for next year so we can improve your experience. It only takes 5 minutes to complete this survey and your responses will help us to better involve and benefit you! Thanks. And finally Broadhempston CLT's book is here! We have had more good news to the tune of £300,000 from the Community Housing Fund infrastructure bid to Homes England. This will pay for the road to the new homes and the new access from the A385. We are thrilled that Homes England and SHDC are working together to support Clay Park. Some of you may have noticed that we have recently started mentioning '31' units at Clay Park rather than the 27 in our original planning application (2927/15/FUL). This is because in response to advice from our partner organisations Young Devon and United Response that self-contained studios/flats are better for meeting the needs of the young people and adults with learning disabilities than shared houses. Discussions with SHDC have been positive but we need to submit a new planning application to change the two former single houses to studios/flats. There will be no increase in the number of houses, the number of residents or parking requirements. Watch this space as we will share the consultation when it's live on the SHDC website so that you can comment. We’ve been spending some of our money from our Postcode Local Trust grant to improve the footpath entrance to the site from the field backing on to Barracks Hill. 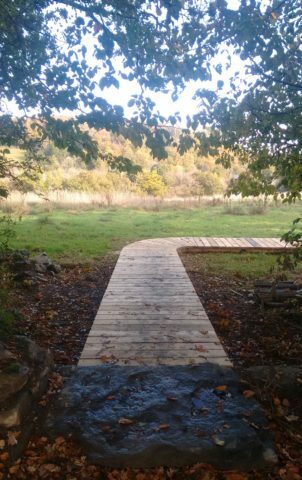 After feedback about the boggy conditions last winter, we have engaged Red Earth Landscaping to create a new boardwalk, replacing the existing short one and extending it to avoid the boggy bit. Please take care over the next couple of weeks if you are walking through as there may be people working, holes, materials, trip hazards, etc in this area. The public footpath entrance from the A385 will also be improved as part of the building contract. We are looking for a part-time administrator to work alongside our project manager, initially for a 6 month period but we hope for the duration of the Clay Park development (subject to funding). This is an exciting role with us - a small grassroots local charity working on a cutting-edge project developing low cost, low carbon housing for local people in housing need. We welcome enquiries from everyone and value diversity in our workforce and are willing to discuss flexible working arrangements. More information on the role and how to apply is available on our website. Closing date: 9 am Friday, October 26th, interviews November 2nd. Do come and join us for our AGM. There will be about 20 minutes of formal activities and then the opportunity to meet us, ask questions about our plans and find out more, and enjoy some refreshments. Dartington Village Hall (the new room). Transition Homes CLT is seeking to appoint a part-time (one day per week) self-employed administrator for an initial period of 6 months, with the intention of extending the position subject to funding. 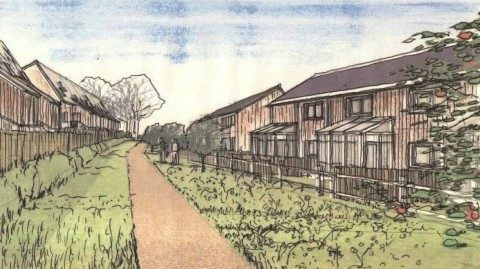 The CLT has planning permission for a development of 27 homes in Dartington and is looking to start on site in spring 2019. This is an exciting role with a small grassroots local charity working on a cutting-edge project involving the development of low cost, low carbon housing with integrated food production, compost toilets, community facilities, and renewable energy. The administrator will support the running of the organisation and delivery of the project. We welcome enquiries from everyone and value diversity in our workforce, and are willing to consider flexible working arrangements. To apply please send a covering letter and CV detailing relevant experience and how you meet the person specification to Nicola Lang at info@transitionhomes.org.uk by 9am on Friday October 26th. Interviews will be held on Friday November 2nd (please advise in your application if you are unavailable on this date) and the successful candidate will start as soon as possible. To discuss the role please contact Nicola by email or on 01803 867358. It will be necessary to attend some meetings and other events outside office hours. Applicants need to be enthusiastic, efficient with a good eye for detail, and comfortable dealing with a wide variety of tasks in a fast moving environment. You’ll be organised and self-motivated, and able to prioritise and manage your own workload. Experience in the field of housing, finance, and/or charity administration, and an understanding of affordable housing development would be an advantage but are not essential. You will be a good communicator, both verbally and in writing, and have experience in the following IT programs/platforms: Microsoft Office (Essential), Dropbox (D), Mailchimp (Desirable), WordPress (D), Thunderbird (D), HMRC PAYE tools (D). Some training can be provided but as this is a primarily computer-based job, confidence with IT and willingness to learn are essential. Download this information as a PDF file here. Representatives of local community housing projects’ (Transition Homes, South Brent and Broadhempston Community Land Trusts plus more TBC) will discuss the progress they have made in developing affordable housing for local people, some of the joys and challenges and their top tips to anyone contemplating a similar project. August - grant funding success! This quarter the big news is our successful grant bid to “HomesEngland” (formerly the Homes & Communities Agency) which means a big injection of funds to help support provision of the 12 shared ownership homes to the tune of £450,000! As you can imagine this is very welcome news and hand in hand with funding from other bodies such as South Hams Council (£108,000), along with cross subsidising from market homes, mortgage finance and some careful “value engineering” will bring the scheme much closer to delivery. Hence we need to support the project through grant funding in order to deliver a scheme that is aligned with these core principles and the needs of local people and the planet. We have a friendly, laid back but determined team, fuelled by tea (and sometimes cake! ), but we've got our hands full and would really appreciate some help. It's an exciting time to get involved as we have planning permission and are aiming to start building this winter, creating 21 affordable homes for local people, including flats for young people and adults with learning disabilities, and 8 open market houses. 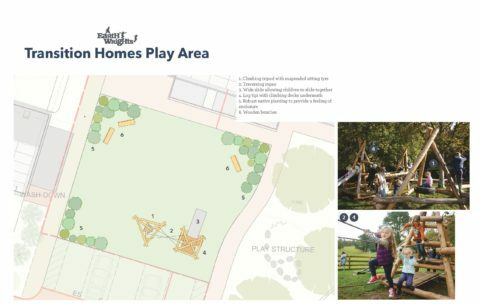 It's a unique project, combining affordable housing with shared facilities, permaculture design and low environmental impact, and we have a lovely 7 acre site where we're restoring and creating new habitats. There are a variety of things you can get involved in so please take a look and if you have any questions please contact Nicola on info@transitionhomes.org.uk or 01803 867358. Landscaping – we’re looking to make some improvements to the public footpath as it enters and exits the field where it gets extremely boggy! Our suggestion is putting in a boardwalk or stepping stones, and removing the stiles. If you’ve got experience in this area and could advise or install a suitable solution please get in touch. Site maintenance – if you’re not fond of meetings or computers but you like doing practical things, we’d like someone to help us manage the site. This would include things like organising volunteer sessions to e.g. 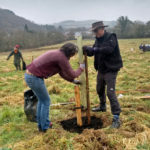 remove the remaining barbed wire or look after the fruit trees, arranging scything of the meadow, keeping an eye on the condition of things on site (fences, trees, barn etc) and helping arrange other site maintenance as needed. Renewable energy – we’re in need of someone with finance and renewable energy expertise to help specifically with putting together the business model, cashflow forecasts, etc for our networked PV array with an eye to securing debt funding. Business planning – as well as the PV array we’re looking to develop a business plan for the community building in order to attract funding. Communications – an opportunity to join the Core group with a focus on communicating what we’re doing to the outside world. This would involve attending one 2 hour meeting a week/fortnight. Allocations, marketing & management - the exciting task of marketing, selling and allocating homes will begin once we've started on site. We have a small subgroup which would appreciate another team member - some kind of real estate, sales or marketing experience would be wonderful, but isn't necessary. 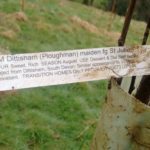 New community orchard at Clay Park! 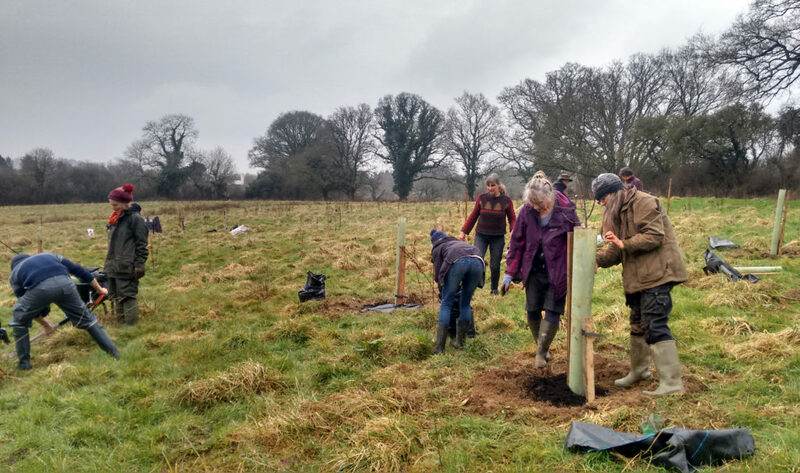 Due to the snow, we had to postpone our orchard planting (as we'd been advised that the trees are vulnerable to damage when temperatures are freezing) although we still popped down to Clay Park to see it in the snow! 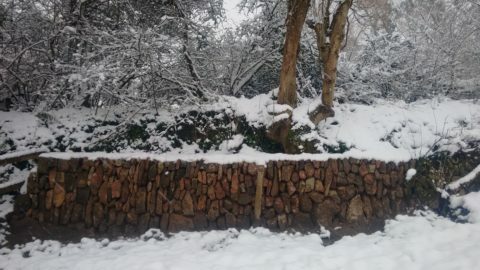 Martin Stallard has been hard at work finishing off the stone walled banks, and they looked particularly lovely with a blanket of snow on them. 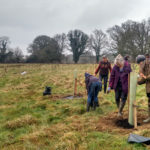 We rescheduled the planting for the following weekend, and although there was a bit of drizzle the weather was much better! Liz Turner (formerly Trees for Health) and Wendy Stayte (previous coordinator for Incredible Edible Totnes) came along to offer their expertise and more than a dozen volunteers showed up to lend a hand. 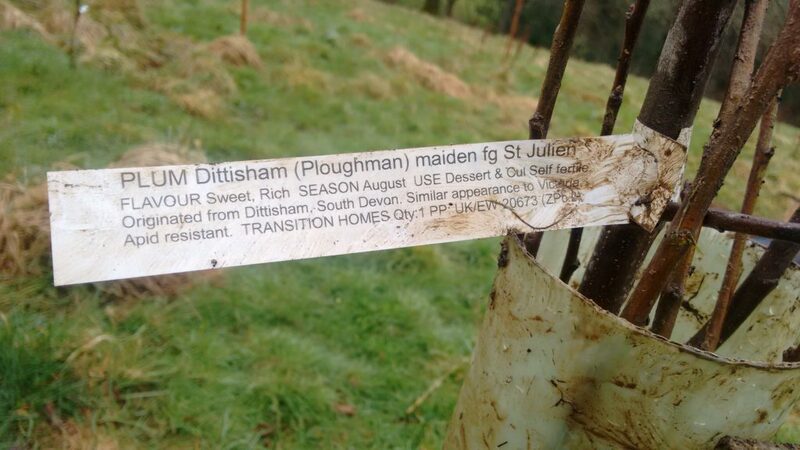 The most challenging bit was hauling everything up the muddy site - of course we would be planting the orchard as far from the gate as possible! 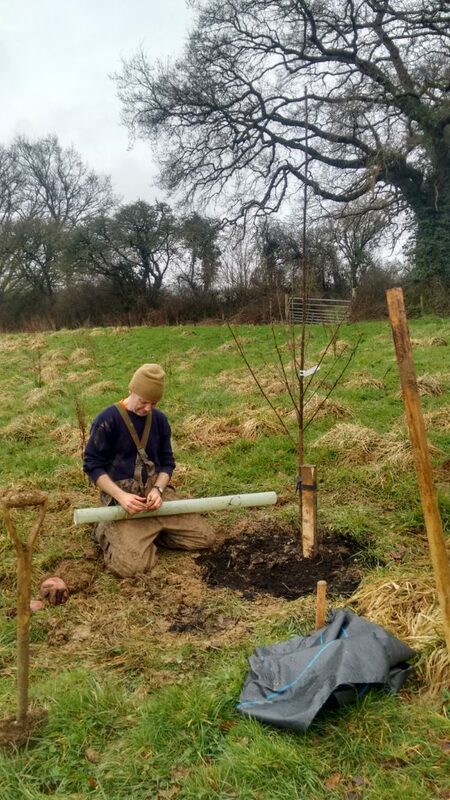 - but planting the trees themselves was straightforward, although each one looks like it has a little fortress erected around it as there is a stake to support the tree and a guard to prevent the local deer from damaging them. This brings our Postcode Local Trust funded activities to an end, although we are shortly taking delivery of our benches from Landworks, and we have a good selection of tools for ongoing maintenance! We're also looking forward to revealing our foraging map of Clay Park, put together by Myrtle Coooper of Wild & Curious Foraging (who has led 4 foraging sessions for us over the last year). You'll soon be able to pick one up from the site entrance. It's very busy behind the scenes at Transition Homes. We're waiting to hear from Homes England (formerly the Homes & Communities Agency) on a grant bid to them for our shared ownership units - we should get a decision any day now. Other grant bids are in the pipeline too. We've tendered the build contract to four local building firms, and have a preferred contractor who we're now looking to appoint. The detailed design work with our civil and structural engineers and our architect is coming to a close, so that the fully designed scheme will be ready for the contractor to cost up. Our detailed highways plans are with Devon County Council Highways for approval. One thing we're really looking forward to arranging with the contractor is community engagement - ideas include a monthly open day where residents and other locals can come along for a tour, to see what's been happening, and hopefully get their hands dirty! A particular challenge for us has been how to embed the use of local building materials, particularly timber, in the build contract. We need a lot of timber, and in order to get an LABC warranty on the homes, timbers for certain uses must be treated and graded in certain ways - which means some things we need aren't available locally. Thankfully we have two members of the team who have been working in the local timber trade for years so know who to talk to, and have been working with our architect to specify - for all sorts of uses from big timbers for the substructure, framing timber, kitchens, doors, cladding, etc - where the timber will be sourced. There are lots of legal negotiations going on with solicitors, neighbours, Devon County Council and South West Water (all very normal!) for the new road and sewer connection. Our M&E (mechanical and electrical) engineers are designing the private wire system and working with Argand to figure out the metering and other requirements for this innovative part of the scheme! 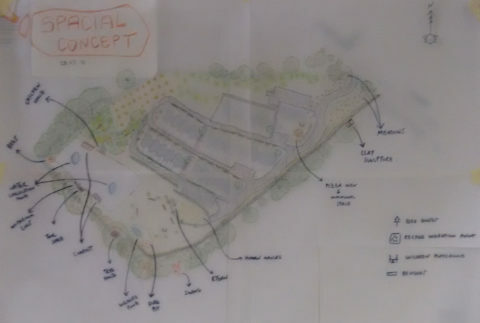 Recently we had a group of local permaculture students use Clay Park as a case study, for them to create their own design for the site which they presented on their final evening of their course. It was fantastic to see their enthusiasm and to hear some new ideas, and we were impressed at their ability to look at an empty 7 acre field and imagine what it may become! Earthwrights have designed us a lovely natural play area to go next to the community building, a local architect has volunteered some time to do some artists impressions of thesite, the new website is under development, and we're shortly about to start a consultation on the ruined barn.... phew. This is just some of what's going on to get ready to start building late in 2018. The team is made up of 6 volunteer Trustees - Tom, Mary, Erica, Laura, Zav, and Ruth - and 3 key volunteers - Jim, Ben and Sally - who all contribute their time around their jobs, and part-time coordinator Nicola. We're always open to volunteers - for example, there are things to do at the site, we're seeking a Trustee with finance experience, and if you're a wiz with WordPress you could help with the new website! Finally, we are seeking supporters to help us cover our modest (~£2000/yr) core costs - if you can donate a small monthly amount to help us then please please fill in this form. Your support would be hugely appreciated! 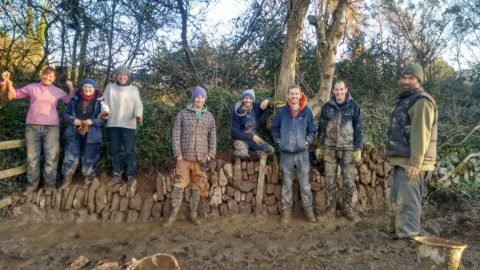 Transition Homes CLT has been restoring the boundaries of the Clay Park site in Dartington, and we recently held a two day workshop on building a traditional stone-faced Devon hedge bank. 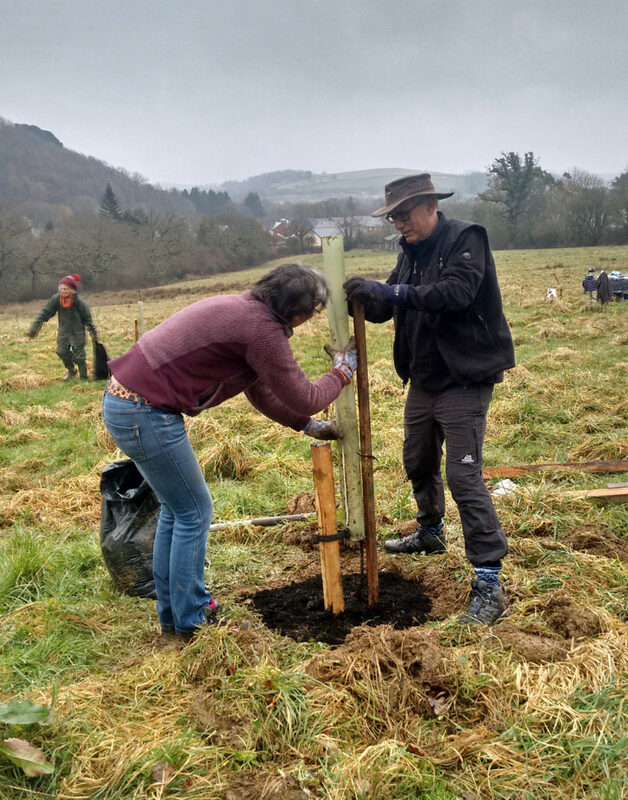 Six eager participants and I [Nicola, CLT coordinator] were led by Martin Stallard in creating a new section of bank to fill a gap where there had been a gate between a stone pillar and an oak tree. Filling gaps in the existing hedge network benefits wildlife by creating a continuous wildlife corridor, as well as providing additional habitat. Building the wall was incredibly satisfying! Ahead of the workshop an earth bank was built by mini-digger, and our first task was to dig a trench in which to lay the foundation stones. As each course of stone was laid the void behind was backfilled with earth, which was compacted with a lump hammer, to stabilise the stones. Each side of the bank took on its own character as there were teams of three working on opposite faces (I think our side is more charming, of course!). We made fantastic progress, but didn’t quite get to the top so Martin will soon return to finish building the bank to the same height as the adjacent bank, and the top will be planted with traditional hedge row species. The following week Martin led a one-day workshop in restoring an existing bank near the entrance to the site. This involved digging out part of the collapsed bank to create a flat base, during which we unearthed a small stream of water which sprung out of the base of the wall, and turned the ground underfoot into a muddy, slippery bog (thankfully most of us were wearing wellies!). 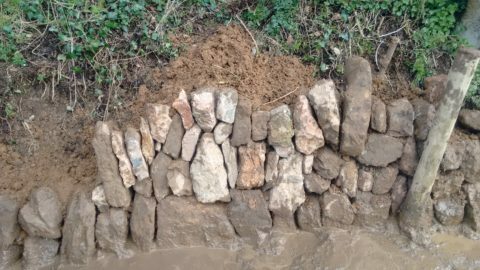 You can see from the photos that this section of wall looks very different to the new section we built the previous week: in this one the stones are placed vertically (to match the existing bank), in the new one the stones were placed horizontally, which creates a different character. 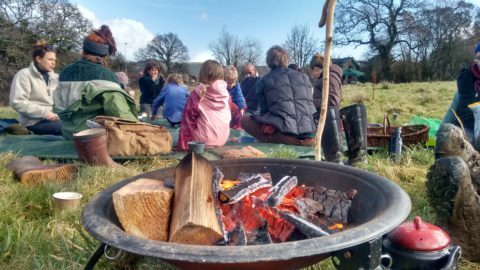 On the same day Myrtle from Wild & Curious foraging led a group of kids, parents & grandparents on a wild food exploration of Clay Park - although some of the kids were more interested in the badger setts, pile of stone, and running around in the long grass! Afterwards they enjoyed a picnic lunch together with wild tea made over the fire. Myrtle had visited Clay Park in all seasons over the last year, and is putting together a wild food map of the site for us which we'll share so that residents & the local community can discover the abundance of wild goodies! More photos from both events are on our Facebook page (you don't need to have a Facebook account to view). 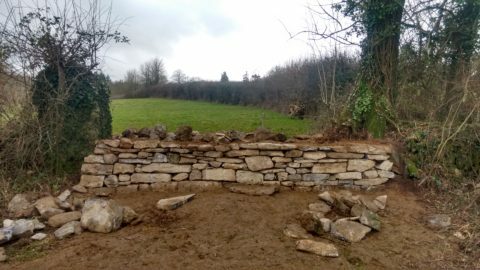 There is a public footpath through the field so we encourage you to go and appreciate the new and restored walls, and the hedge which was laid during a workshop in the autumn, which should soon start shooting. Next, we’ll be planting a community orchard at Clay Park for future residents and the community to enjoy – a mix of fruit and nut trees. 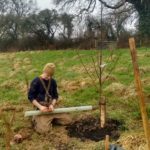 Join us on the afternoon on March 18th (2-5pm) to learn about establishing and caring for young orchard trees, and lend a hand with the planting! Hot drinks & cake will be provided. These activities are funded by the Postcode Local Trust, supported by players of the People’s Postcode Lottery - this has paid for tools, materials, Martin and Myrtle's time, and lunches for participants from Sima at the Kitchen Table. We’re also delighted to have commissioned Landworks on the Dartington estate to make some benches for the site using funds from this grant.